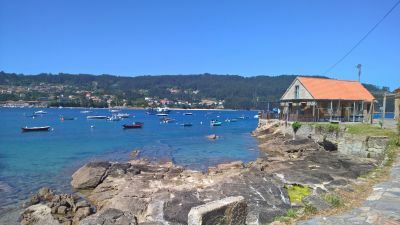 Our Camino de Santiago Way by the Sea tour weaves in and out of the picturesque Rias (Estuaries) of Galicia´s Rias Baixas region. This private journey starts in Vigo, the most important fishing port in Europe, which has a beautiful Ria holding the secrets of sunken treasure and historic battles. Being an important fishing port it is obvious that the area is blessed with an abundance of the freshest fish & seafood, on this trip we will get a chance to savor many fish & seafood dishes in the best restaurants of the region, and also catered lunches when eating aboard the yacht. Talking about food I can`t forget to mention that this area of Galicia is also a wine region, bearing the same name, Rias Baixas. Here can found excellent full-bodied white wines made of the Albariño grape variety. Albariño wines are known as the "Wines From the Sea" because they go so well with fish & seafood. In the past few years thanks to wine writers like Michael Franz who writes for the Washington Post, these wines have become more internationally known, and now can be purchased in America and other countries in the world. In the Rias Baixas there are many beaches of untouched beauty, golden soft sand and clean blue water. While navigating we will stop to take a swim in many of these waters, some where the tourists can`t even get to by land. Also we will visit many of the small Island off the shore, like the Cies Islands know as "The Island of the Gods" and the Ons Islands, actually just recently these islands and few smaller ones close by, have been declared as a national park called "The Archipelago Atlantic Islands National Park" . Here can be found all types of wild Flora & Fauna, excellent for nature hikes & walks. Our sea portion of this journey comes to an end by following around the Arousa, where according to tradition, was where the body of the Apostle St. James (Santiago) was brought to Galicia after his martyrdom in Jerusalem in the year 44 AD. In the village of Padron it is said to be the place where the tomb of St. James was discovered, from here it was brought to where now the Cathedral of Santiago de Compostela stands. What a great way to finish to this gastronomical, cultural, nautical, sailing adventure by standing in front of this outstanding Pilgrimage Cathedral! Boarding the yacht we sail across to the Playa de America just like La Pinta did bringing word of the discover of America to Europe. In the morning we set sail over to the next ria, passing by DONON on THE PENINSULA OF O MORRAZO, then passing by the Ria of Aldan. Then we will have lunch in a Fishermen´s Tavern with fresh fish & seafood located on the port famed for the Galicia Pulpo (Octopus). Entering the last Ria on our journey, which is the Ria of Arousa, here starts the	MARITIME ROUTE TO SANTIAGO. The maritime and river route along the Arousa estuary and the river Ulla commemorates, according to tradition, the arrival by sea to Galicia of the body of the Apostle St. James the Greater, after his martyrdom in Jerusalem in the year 44 AD. St. James was a sailor and fisherman from Galilee, an apostle of Christ, the evangelizer of the West, and a martyr. The episode on his death, ordered by Herod Agrippa, is contained in St. Luke´s "Acts of the Apostles". Padron is where St. James´s body was disembark and this village is also famous for its small little green pepper Pimientos de Padron "Some are hot & some are not!" Starting the day with a guided visit of the Cathedral of Santiago and the old quarter. Then a visit of the plaza de Abastos market with our foodie guide. Rest of the day at leisure to explore the city. We highly recommended you visit the Museo de Pobo Galego (The Museum of the Galician People) which shows the way of life in Galicia and a lot of things you have learned about and seen this tour. Final "Goodbye Dinner" at a special location and with the famous Galician Quiemada! Transportation in air-conditioned Sedan, Minivan or Minibus depending on group size with chauffeur when land transportation is needed in the itinerary.